We are active contributors and supporters of open government. 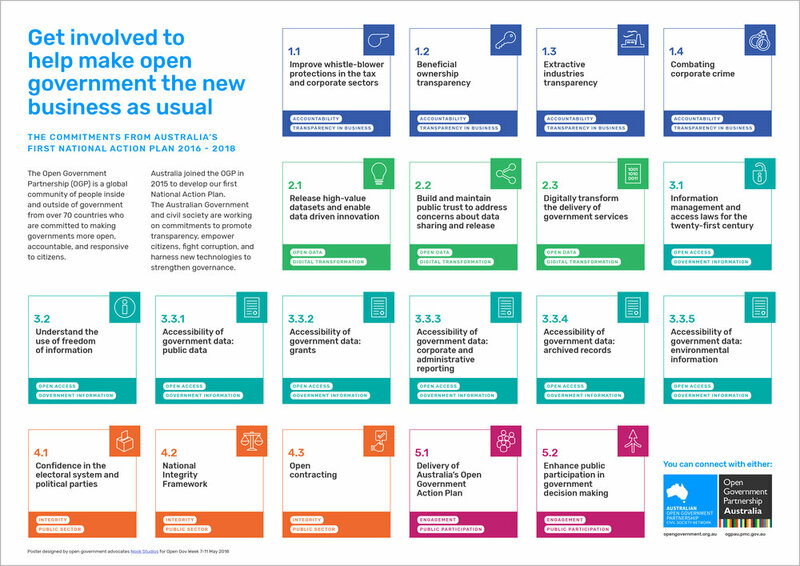 For Open Gov Week 2019 we launched Making Open, a channel dedicated to helping promote open government. A home for practical how-to stories, original and curated content from around the world, interviews with open government champions, and a platform to show what can be done. Using process to raise awareness and engagement. Publish What You Pay (PWYP) is a global campaign for transparency and accountability in the mining and oil and gas industries. PWYP Australia works with the global PWYP network of over 700 civil society organisations in 40 countries to ensure that mining and oil and gas revenues are used for social and economic development, and poverty reduction in resource-rich countries. In Australia, the campaign is supported by a coalition of 25 organisations that are committed to promoting good governance to ensure that citizens benefit equitably from their natural wealth. Mel is a member of the Steering Committee of PWYP Australia and Nook provides pro bono support for the hard working local co-ordinator, Jessie Cato. Local advocacy projects include the progression of the Extractive Industries Transparency Initiative (EITI) in Australia, mandatory disclosure of financial data, beneficial ownership and open contracting. We are active contributors and supporters of open government. This year alone (2018) we have contributed over 400 hours to open government advocacy and work. We support the OGP Civil Society Network when we can, and create things like process pathways, write submissions, contribute ideas for commitments, help support the OGP Secretariat and other government commitment custodians, by wrangling participants to consultations. We do this work pro bono and it is funded by us because we are committed to ensuring open gov is embedded and successful. Under the existing NSW procurement framework it is difficult for government staff to find, engage and contract creative and cultural enterprises and workers. This article is a call to action for the NSW Government to reform its procurement scheme and policies to be more inclusive. There are hundreds of community recycling enterprises and innovators all over Australia, located in urban centres, rural towns and in our most remote communities. This 11 minute pitch doco was produced in 2012 to help raise awareness about their work. It was made specifically for local council waste managers and policy makers to encourage them to support their own local recycling enterprises. The film was widely shared and successful in inspiring many local councils to support and help scale social enterprises in their local communities. In 2017, the Community Recycling Network took on the new identity of Zero Waste Network Australia with the support for South Sydney Regional Organisation of Councils (SSROC).